ExtremeTech reports AMD is moving the production of its energy efficient chips to TSMC, full details over here. The site claims AMD canned its Krishna/Wichita APUs after it became clear that GlobalFoundries wouldn't be able to achieve decent volume. AMD currently only pays GlobalFoundries for good 32nm dies, but this contract expires on January 1, 2012 and AMD sees no point in paying a per-wafer fee for a slow, low-yield product ramp. Last month, we published a story on how AMD may have shifted its focus from Bulldozer to Bobcat in the wake of the former’s disappointing performance. 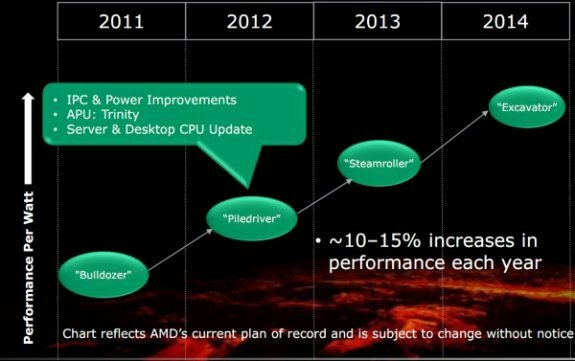 Since it ran, we’ve spoken to multiple independent sources that told us AMD’s 28nm Brazos-based APUs were in serious trouble and would likely never see the light of day. AMD reportedly finalized the decision to cancel both products right around the time it fired most of its PR and marketing divisions. Sunnyvale will likely announce a new set of 28nm APUs at its Financial Analyst Day in February. Unlike the failed Krishna/Wichita designs, the new chips will be manufactured by TSMC. The implications and financial repercussions could be enormous. Moving 28nm APUs from GlobalFoundries to TSMC means scrapping the existing designs and laying out new parts using gate-last rather than gate-first manufacturing. AMD may try to mitigate the damage by doing a straightforward 28nm die shrink of existing Ontario/Zacate products. While the resulting chips wouldn’t incorporate any of the architectural improvements originally intended for Krishna/Wichita, they’d lower Brazos’ power consumption and buy time for a new processor. The cancellation leaves AMD without a new ultra low-power product family, and unfortunately the high-end of the company's product line doesn't look too appealing either. The new Bulldozer architecture performs worse than anticipated, and the company's current plan to improve Bulldozer by 10-15 percent per annum doesn't make us jump for joy either.